Hanoi (VNA) – Vietnam and Sri Lanka will provide favourable conditions for their enterprises to seek business and investment opportunities, senior diplomats have said. 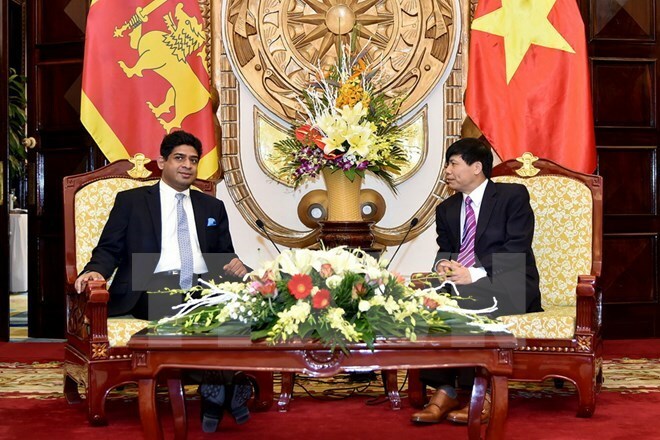 Deputy Foreign Minister Dang Dinh Quy had a meeting in Hanoi on August 1 with Sri Lanka’s State Minister of Foreign Affairs Vasantha Senanayake, who was on an official visit to Vietnam from July 31 to August 1. They noted with satisfaction the progress in relations between the two countries, as well as between the two foreign ministries, especially after high-ranking visits, including an official trip to Vietnam by Sri Lankan Prime Minister Ranil Wickremesinghe last April. The two sides agreed to increase mutual visits at all levels and people-to-people exchange. They will also work to soon organise the third political consultation at the deputy foreign ministerial level. They agreed to discuss measures to raise bilateral trade to 1 billion USD in the near future as targeted by the two countries’ leaders. At the event, the officials exchanged views on regional and international issues of shared concern, adding that Vietnam and Sri Lanka will continue coordinating and supporting each other at regional and international forums. The Sri Lankan side promised to actively consider support for Vietnam’s candidacy for the post of UNESCO Director General in the 2017-2021 tenure and for a seat in the UN Security Council in 2020-2021.